you are looking for quality pet sitting." services of a kennel. Thanks so much for a wonderful job! and I would highly recommend her. dogs are doing and gets back to us immediately if we contact her about anything. When we return, we can tell that she has provided our dogs with loving care. We highly recommend Dee as a dog sitter. 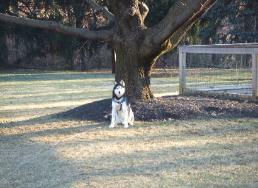 on the care Dee provided for our dear dog Gettysburg .We were fortunate to find you late in Gettysburg's life. down, he could not sleep or lay down for extended periods of time and needed help to stand and eat or drink. our family, I know who we will call first. Thank you for the kind care of our friend. again on your next trip. My husband and I heartily recommend Dee. We have had Dee for the past 3 yrs. and LOVE her service! Our pets are happy and safe in her care.